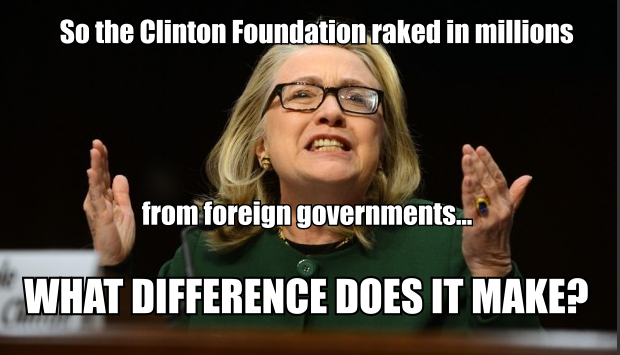 Hillary was taking foreign donations WHILE SECRETARY OF STATE. Clearly, we need another Dana Milbank column on why Walker is disqualified. Twitchy: Open Air Bribery (clearly Hillary Clinton's actions must show why Scott Walker should be questioned further over Rudy Giuliani's statements). Smitty: Will no one rid us of this Turbulent Godbag Christofascist Scott Walker? "@CuffyMeh: You know what is literally un-American? Taking bribes from foreign governments. pic.twitter.com/D5slLagmdR"
Instapundit: Culture of Corruption and why did they lie about the film maker and throw him in jail after Benghazi? Someone in the media should ask the question of those Democrats. AoSHQ: Is it legal for Hillary to take Bribes from Foreign Governments? Hell no.